A new loosie from the afro-pop giant. On Thursday, Burna boy shared the music video for his newest single Gbona. Watch it up above. The clip is filled with scenes of lush green trees amid a hazy sky, as Burna and a number of dancing counterparts gleefully bop to the song's thunderous rhythm. 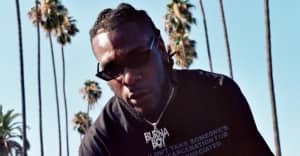 Last month, Burna Boy premiered the music video to his infectious "Ye", off of his Outside album via FADER. And earlier this summer, the song received a major push on streaming services by having the same title as Kanye West's eighth studio album ye, released this June. Watch the "Gbona" video above.